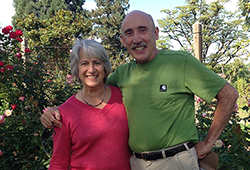 For Tom and Patti Barkin, Eugene's Jewish community has provided them with a spiritual, emotional and social home for nearly 40 years. Over the decades, Temple Beth Israel has been the true center of this home, which is why the idea of making a legacy gift in support of the synagogue was logical to them. "We were very involved in the temple's capital campaign to build our beautiful new home," shares Patti. "Building a temple was a once in a lifetime experience. Leaving a legacy beyond that, well, that's what we do." The couple feels that the LIFE & LEGACY program has been really motivating and has allowed the legacy conversation at TBI to begin in earnest. "The temple has been the recipient of occasional bequests over the years but it was the LIFE & LEGACY initiative that really allowed the TBI team to cultivate and solicit such gifts," explains Tom. The Barkins hope that future generations in Eugene will find a Jewish community as welcoming and dynamic as the one they have been a part of for almost forty years.